Gypsy Boy on the Run is the phenomenal story of a young Romany Gypsy boy who runs away from his family. In this sequel to Gypsy Boy, Mikey Walsh invites us into a distant world unfamiliar to our own where we gain insight into the Romany Culture. A male dominated -world where women are second class citizens, education means nothing, acts of violence solve issues and homosexuals do not exist. We see Mikey Walsh’s struggle throughout the book as he makes the decision to leave behind all he knows and loves to be who he is. From the age of seven, Mikey Walsh is different to other gypsy boys. He knows this and wishes to be accepted by his father, an honoured man in his community. At age fifteen he spends his night times praying to God that he isn’t actually gay. Throughout this story his wish to hear his father utter the three words ‘I love you’ is something he clings to. However, it is his father’s rejection which cements his decision to leave home and pave a different future for himself, to defy his culture and its beliefs. On his journey he meets different people who help him along the way, strong characters who inspire him, steadfast friends who encourage him and remain in his life ‘till the end. A character that greatly influences him and remains in his heart is his mother. She haunts his memories, continually cropping up in times least expected to put a smile on his face and bring a tear to his eye. A strong traveller woman, she stands for everything his father is not, and recognises that different is good. This is essentially a story of survival, of endless hope and courage as one young unhappy fifteen year old boy changes his future and his fate. Mikey Walsh will not grow up to be a gypsy man, like his father and his father before him. Gypsy fighting, drinking and conning are no acts which appeal to this travelling man. It is one man’s story of not giving up and striving on, facing his demons and killing them. It is a journey that Mikey takes not alone, but with the company of the reader; beside him all the way we share his darkest moments and thoughts, his ugliest falls and his greatest successes. His natural and relaxed tone helps him achieve this. We read on in support and anticipation as our friend, the underdog wins. This is a true a story where love conquers all. Love for his family and his culture is prevalent, having left all he knows behind him, Mikey Walsh still is proud to be a gypsy and looks back on his memories with fondness; whether it be singing to Disney movies with his sister Frankie, or hiding under a rug in the backseat from the witches as his mother secretly smokes a cigarette. Even the numerous beatings from his father and the other men in his community cannot extinguish his strong feeling towards a way of life and a people that means so much to him. Leaving the familiar behind, Mikey becomes a changed man. Never will he fit into this world that he yearned to be a part of and missed so much. Instead the ‘gorgia’ world has become his oyster and he proves he can achieve anything he puts his mind to. 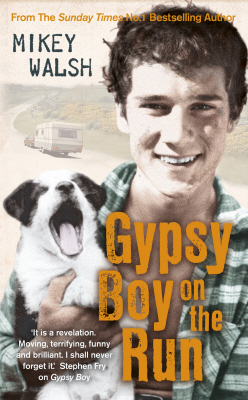 Gypsy Boy on the run is one remarkable story about one remarkable person. Next week Lady Ardour will be reviewing Titus Groan by Mervyn Peake.